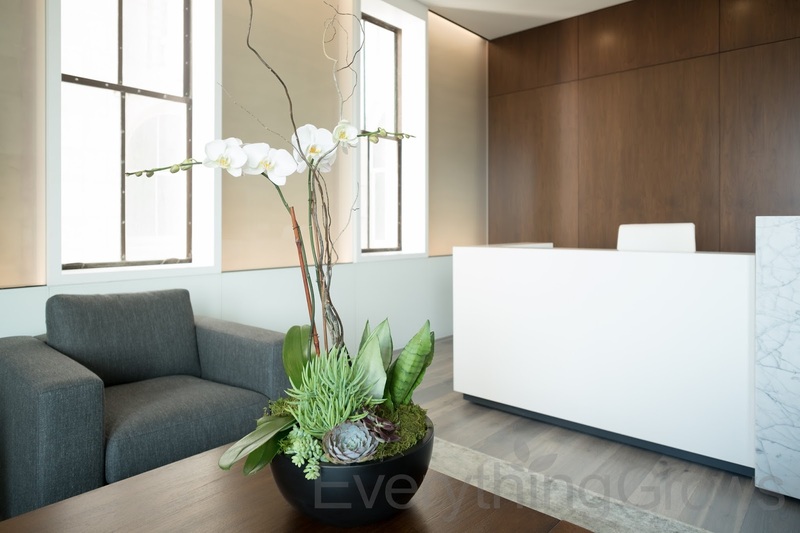 Here at Everything Grows, our interior design staff customize every interiorscape to suit the decor, sensibilities and architectural feel of the client's space. 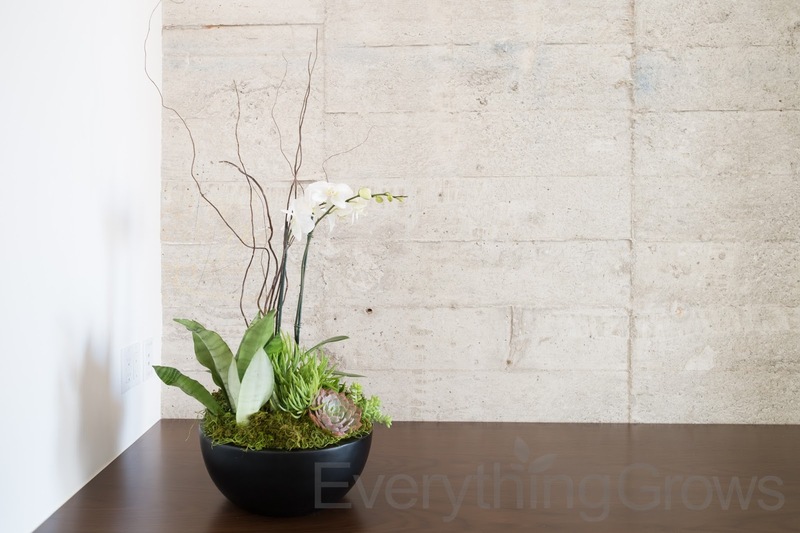 At this ultra-modern San Francisco firm, our designer chose arrangements, finishes and plants that add a minimalist's touch. The orchids and succulent arrangements are a stylishly simple complement to the wood and concrete features and fixtures. 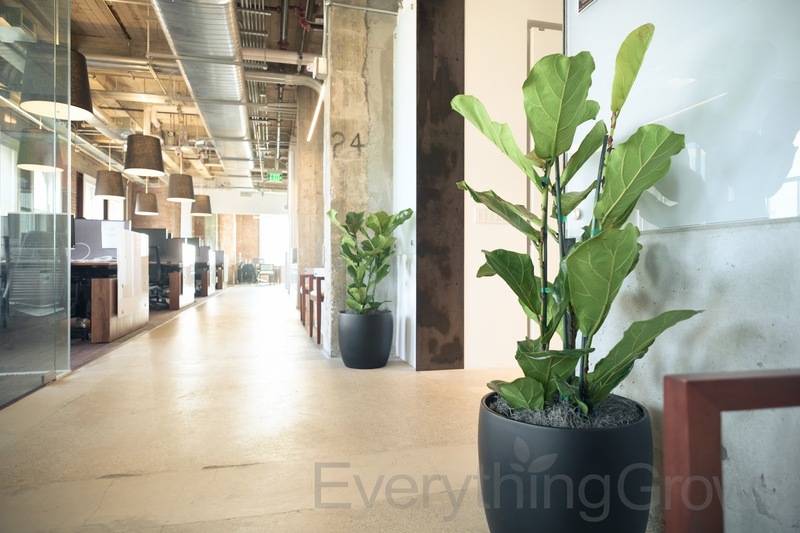 These matching Ficus Lyrata plants soften the squared edges and exposed concrete just enough to bring a sleek, understated contrast to the entry. Have a vision in mind to transform your office space? Everything Grows is here to help make your vision a reality. We offer complimentary site visits and can accommodate almost any budget. Contact us today and one of our designers will be happy to assist you! Random Acts of Flowers recycles and repurposes flowers by engaging dedicated volunteer teams to deliver beautiful bouquets and moments of kindness to individuals in healthcare facilities across the country. Everything Grows goes through a lot of Orchids and Bromeliads and when we have extras we donate them to the Random Acts of Flowers Silicon Valley location. Flowers and plants do help heal, and being a Certified Green Company this is a great way to reuse something in a very helpful way. “Home Ecology Study” By Nancy Etcoff Ph.D. This variety of Sansevieria - the Sansevieria Moonlight - features a beautiful silhouette and a distinctive, silvery green coloration. 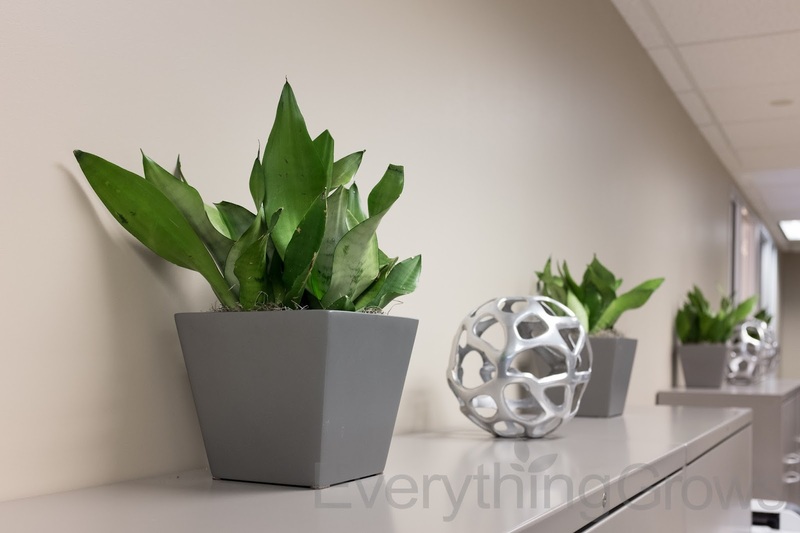 The plant is hardy and tolerant of low light, is stingy with water and adds an architectural touch to an otherwise bare surface atop the file cabinets at this Northern California office. We find that these plants retain their shape, size and coloration better than a like-sized Aglaonema in similar lighting conditions - and with much less leaf loss. Do you have a vision in mind to transform your office space? 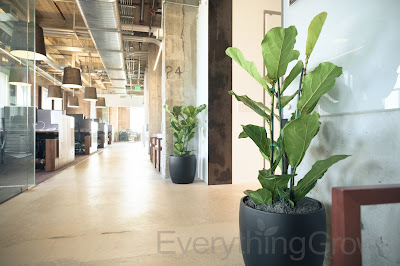 Everything Grows is here to help make your vision a reality. We offer complimentary site visits and can accommodate almost any budget. Contact us today and one of our designers will be happy to assist you! Plants are able to help clean the air. They help to reduce pollutants such as ozone during the day. At night, thanks to photosynthesis, they convert carbon dioxide into oxygen. This process also increases the local humidity, forcing toxins and other airborne volatiles to settle so you don't have to breathe them the next day. Plants also have the ability to change the levels of stress in an environment. 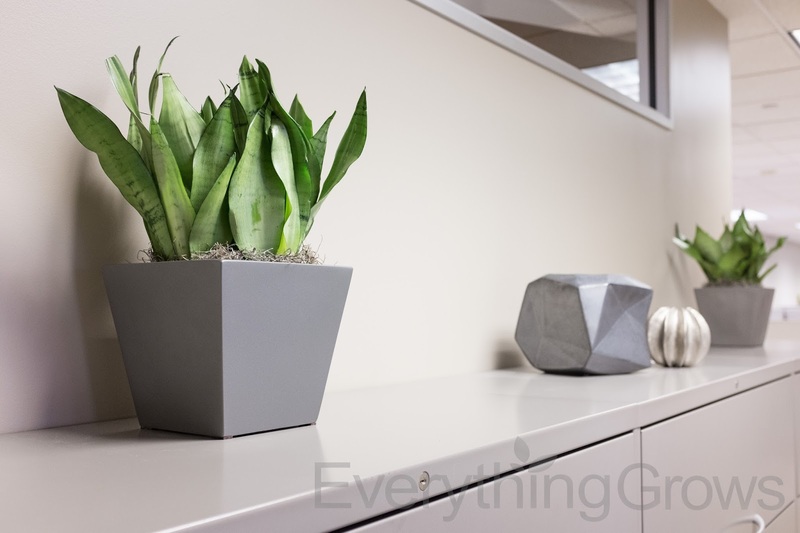 In 1996, a study revealed the benefit of plants in the workplace to help control stress and increase productivity. Then in 2006, a rather remarkable study showed how plants in hospital rooms could actually help patients heal faster. Though the majority of reasons were psychological, the molecular contributions should not be ignored. There may be another advantage to having plants in the room, though the benefit is not chemical, but microbial. In a study published last month, an international team of researchers unveiled the hidden microscopic benefits of having plants in the room. Based on their findings, plants contribute to a strong microbial diversity indoors and may help to keep the locker room effect at bay. Interested in plants to improve the indoor environment for your workspace? Let Everything Grows create your indoor garden. 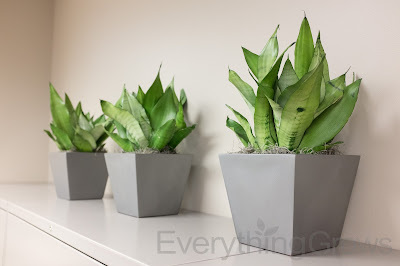 Selecting the right plants for your office environment is our specialty. Contact us today for a complimentary site visit and design consultation.